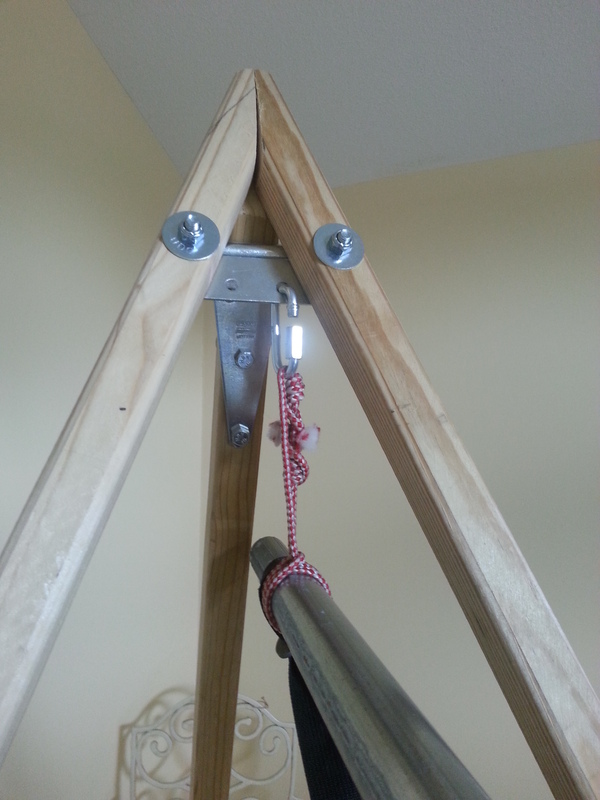 My first DIY (Do-It-Yourself) Project – A hammock stand! After reading about a portable and easy to make hammock stand, I finally decided to make one. There are several threads about this on http://www.hammockforums.net – the original thread is here: https://www.hammockforums.net/forum/showthread.php/51787-The-TurtleDog-stand?highlight=turtledog. There are many other threads that incorporate different options although the basic construction is the same. The advantages are that this stand is relatively light, easy to make, and the materials are affordable. There are also several disadvantages as well. It is not built for swinging in the hammock, it can be unstable in high winds unless staked down, and care must be taken (several methods are available) to ensure the legs don’t spread out too far because you will find yourself on the ground…. I am not a carpenter or handyman. My tool selection is rather small and this is actually the first thing I have made as an adult “from scratch.” So I did LOTS of research and planning prior to construction. Here is a list of the items I purchased from my local Lowe’s Home Improvement Store. The cost of the materials was $57.31 not including tax. I began by trimming each board to 7 feet long. While this is higher than the recommended length of around 6 feet, it gave me some flexibility when I use the longer pole (more on that later). I can always trim off the bottom of the poles if they are too long. Once I had the poles the correct length, I marked and cut the angles for the ends of the boards. By using the correct angles, the poles support each other and do not allow the poles to spread out any further than the desired 45 degree angle. The end result is that the distance between the feet of the poles are equally spaced 5 ft apart and the angles between each poles are also 60 degrees each. By all the spacing and angles being the same, this spreads out the force equally. The two poles that rest against each other are cut at a 22.50 degree angle and the third pole that rest on the other two legs is cut at a 45 degree angle. That allows all three to fit snugly together. I then marked and drilled the holes in each board to match up to the placement of the gate hinges. Having another set of hands and plenty of space makes this step easier. I first connected the two poles that rest against each other and then attached the third pole. (measuring and checking twice and drilling once was very important here). I did have to slightly enlarge the holes in the gate hinge with a 5/16′ drill bit to allow the bolts and quick link to easily fit through the holes. As a note, the bolts on the poles that rest on each other (the ones with the 22.5 degree cuts) do not need to be tightened too tight if you plan on transporting the stand as pivoting the legs become difficult. Once each tripod was assembled, I attached the quick link to one of the holes in the gate hinge and used some spare cordage I had at the house and tied a loop using a blood knot. I then used the loop to form a prusik knot on the pole and used the quick link to secure the other end of the loop. The pole was then suspended under the tripod. It is important that the pole attaches directly underneath the hinge to keep the force directed straight down when weight is applied. I then suspended my Warbonnet Blackbird (http://www.warbonnetoutdoors.com/blackbird/) by running the straps around the pole on the outside of the cordage and used a Dutch Clip (http://www.dutchwaregear.com/dutch-clip.html) to secure the strap back to itself. I tested outside on the grass just in case there was a failure. I slept in it several times and it feels very solid. After this picture was taken, I have sprayed the pole with flat black paint and also stained and sealed the wood just for appearance. My original plan was to use two 6’ sections of top rail, but my local stores didn’t carry it in stock and I didn’t want to pay the shipping cost. The 10.6’ section works well for one of my hammocks, but is too short for my tarp (for outside testing) and my other hammock. I’m still searching for two 6’ sections for use with those items. By using two six foot sections, I can easily disassemble and transport in my car with the back seat folded down. As a note, care must be taken that the legs are placed on a nonslip surface (in my case either grass or carpet). If this stand is set on slick surfaces such as concrete, tile, hardwood, etc, stress will be added to the tripod possibly causing failure. Some people suggest placing rubber chair/table tips on the ends of the poles to prevent this but I have been unable to find any the correct size. If you decide to make one, PLEASE do your homework and research first. And of course, hang no further than you are willing to fall…. 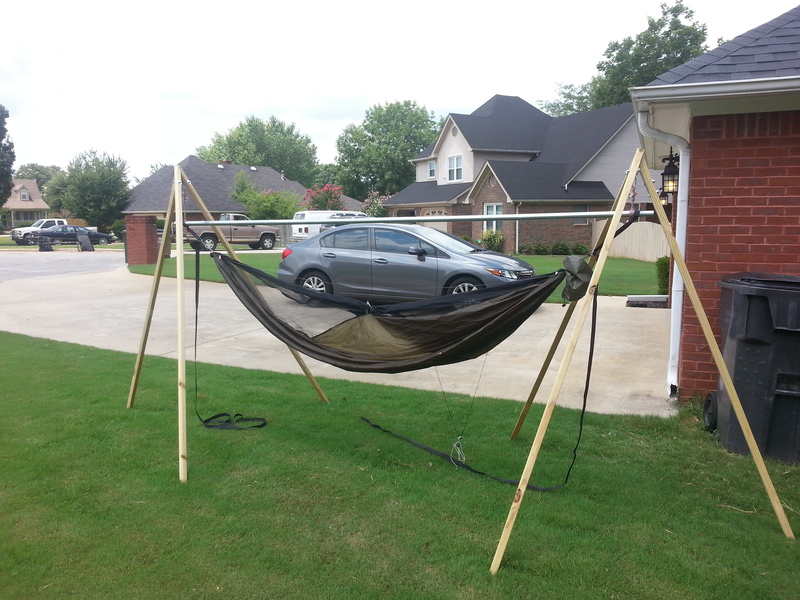 This entry was posted in DIY, Hammock Camping, Report, Testing. Bookmark the permalink. 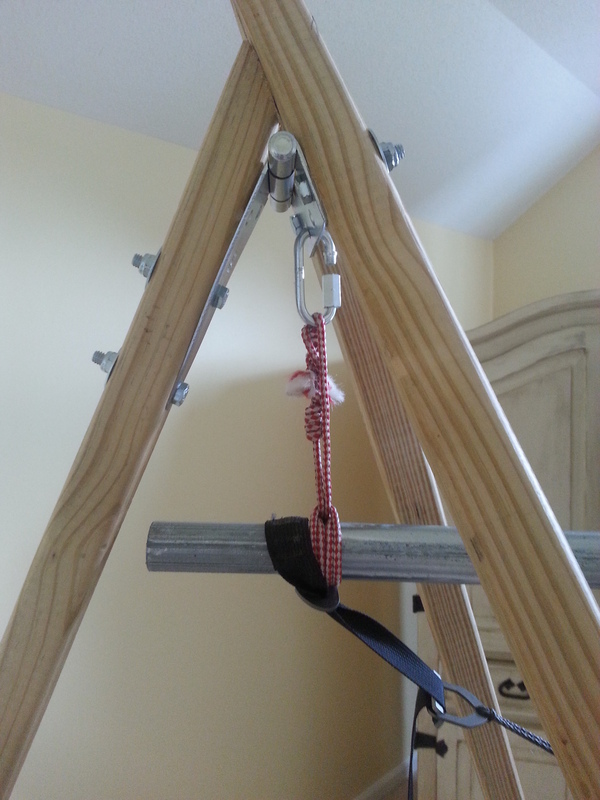 2 Responses to My first DIY (Do-It-Yourself) Project – A hammock stand! I’m trying to replicate your build. I cut the ends of my 2×2’s to 22.5 with a miter saw but they don’t look as steep as your angle. Did you lay this down on the miter saw or use something else to cut it from the end? Really good looking build though, hope I can figure the layout a little better! I just guessed, (and fine tuned a bit) but measured afterwards.